You Can Donate Your Jury Duty Pay to Charity. Click here for more information. The local courts and Jury Assembly Room staff will never call you or email you and ask for Social Security numbers, credit card numbers or other sensitive information, nor will we call and demand payment over the phone of a fine for failure to appear, including the placing of any amount of money on a green dot card to pay any fine. We have listened to your ideas and suggestions and now, you can reschedule your jury service online or through our automated phone system immediately upon receiving your summons. To reset, disqualify or exempt yourself from jury service, first enter your 8-digit HC number or Texas Drivers License Number (TDL) and last name in the appropriate textbox below. (Your 8-digit HC number can be found at the top-left section of your Jury Summons Form, next to the bar code). Once you have entered your information into the textboxes, click the Search button and follow the instructions provided after your summons information has been retrieved from our system. We now have Free Public Wireless Internet available while you wait through the jury selection process. Please note there are limited power outlets available for use at this time. Please ensure your electronic devices are fully charged before reporting for Jury Service. It is advisable to eat breakfast as we do not know when or if the court will break for lunch. If you do not have your Juror Summons, you may try the search by entering your Texas Driver License Number. However, your TDL number may not be on file with us; therefore the best search criterion will always be your HC number. If you have lost your Jury Summons, you can print a blank summons to help expedite your check-in process. Note: you must have Adobe Acrobat Reader to view or print this file. 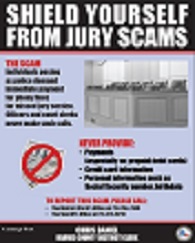 Learn how to shield yourself from jury scams. Identity thieves have contacted Harris County residents and threatened them for failing to report for jury service. The thieves are seeking confidential information. The local courts and Jury Assembly Room staff will NEVER call you or e-mail you and ask for Social Security Numbers, credit card numbers or other sensitive information. Do not give out such information to anyone claiming to be with the judicial system who calls or e-mails you. If a person did give out his/her Social Security Number, the DA’s office recommends calling the Social Security Fraud Hotline at 1-800-269-0271 and all three credit bureaus.